Huntsville represents true cottage country with a plethora of sparkling lakes, flowing rivers and spectacular natural scenery. As the largest town in the District of Muskoka, the area covers a massive 68,716 hectares, found just over two hours North of Toronto and one hour and twenty minutes South of North Bay. An impressive network of lakes enables residents to boat over 65 km, right from their cottages to downtown. Read more about Huntsville here. The charming downtown is known as Historic Downtown Huntsville, and here is where residents and visitors head to for a variety of unique shops, services and restaurants. For those who prefer golf over shopping, the area offers world-class golf with a great variety of golf courses to choose from. And for those prefer waterfront living, Huntsville has it all. Learn more about properties in Huntsville or start your search for homes on Muskoka's most advanced real estate listings display below. Contact Relaxed Living Realty Inc., brokerage, if you'd like to arrange for a showing. Never miss out on a great deal again when you register with us! We'll email you new alerts when homes in Huntsville enter the market that meet your individual preferences. With the perfect combination of natural wonders and city conveniences, real estate in Huntsville is highly coveted. Quaint character homes and beautiful waterfront communities on the shores of Mary Lake, Peninsula Lake, Fairy Lake and Lake Vernon that exemplifies Huntsville cottage living at its finest. With a magnificent combination of sports and leisure activities to choose from, as well as shopping, dining and a fabulous arts and culture scene, there are many reasons why homebuyers choose houses, condos and cottages in Huntsville above all other communities. 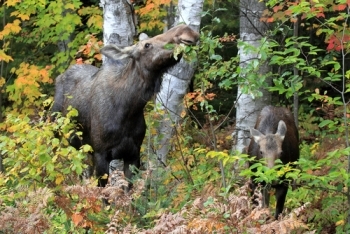 Algonquin Park is found adjacent to this community and some of the park’s popular activities include biking, boating, canoeing, fishing, hiking, picnicking and wildlife viewing. The community of Huntsville is packed with amenities, from a notable collection of golf courses, to several gyms, fitness and yoga facilities, plus arenas and swimming pools. With the selection of delectable restaurants in the area, you may never want to cook again! From upscale restaurants, serving delicious creations, beautifully presented with a variety of authentic cuisine, Huntsville restaurants have it all. Many of the local restaurants boast water views and some of the best caesar salad, gelato and breakfast dishes you’ve ever had. The arts come alive at The Algonquin Theatre, offering live entertainment throughout the year, while there’s also the Huntsville Community Theatre Company which performs in the charming Chaffey Hall community centre. Summer visitors with cottages in the area will want to visit the Farmer’s Market held every Thursday. For those interested in living in the community year round, there are local schools in the public, Catholic and private school systems. Relaxed Living Realty's agents are pros when it comes to real estate in Huntsville. Contact us and we'll be happy to answer any questions you may have about property for sale in the entire Muskoka area.